The closed gates. Just try to tell me that this doesn't look like a place with sacred dirt. In Santa Fe I stopped by to see a work colleague. Within the first few minutes of our conversation, she had convinced us that we had to go see the town of Chimayo about 45 minutes outside of Santa Fe. 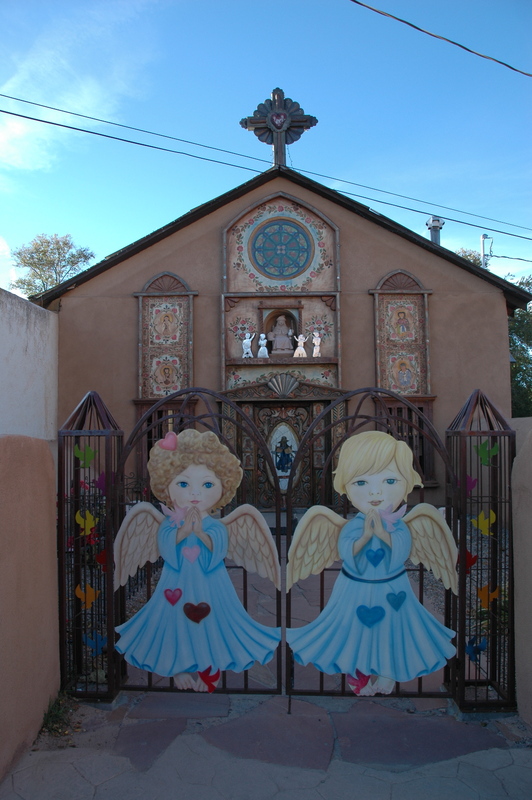 Apparently there is a famous sanctuary in the Chimayo and to take some of the dirt from the ground of this sanctuary is supposed to have bring good luck and health. Decision made. I figured at this point, I should be taking all the help I could get. Unfortunately the sanctuary closed at 5pm and we rolled up at 5:20pm. Perhaps seeing the sanctuary wasn’t meant to be, but meeting our new favorite chili vendor was. I just wanted to wander into one of the galleries that still looked open, but the chili vendor stopped us. He persuaded us to take a pistachio, “put it in your left molar”, and then chew it with a pistachio shell full of whatever magnificent chili mix he happened to have ready for us. Each trial was followed by a list of possible dishes that could made with the chili: Red was for baked chicken, spaghetti, guacamole. Green was for fish, salsa, etc, etc. I might just be evolving into a softy for a driven entrepreneur, but within 10 minutes he had sold us not one but two bags of chili. If we actually had a kitchen still in which to use them, I probably would have bought many more bags. Heading back to car, I had the thought — if you can’t walk away with a bag of holy, healing dirt, two bags of chili might just be the perfect substitute.